I am, what you might call, an anti-snob. Pretentiousness is one of the highest ‘pet peeves’ on my lengthy list of pet peeves. No matter how educated you are, or how rich you are, or how ‘cool’ you think you are, when stripped of the material things in our lives everyone, at the core, are naked and afraid. Being pretentious is the least attractive characteristic of being human. When I first learned about the NJOY Artist Collection my immediate thought was how pretentious it was. To think that wrapping eliquid in fancy packaging, and I mean really fancy packaging, would make these eliquids somehow “important”, or above all others, was gut wrenching. I’ve seen so many horrible ploys in this industry, and if this Artist Collection was just another ploy to separate vapers from their money, I was going to be faced with finding a way to inform the potential victims . Of course, these knee-jerk reactions are so typical of me nowadays that I reacted like I did without learning anything about the collection, what was in it, how much it would cost… I just saw this ultra deluxe packaging and went straight to “pretentious” and “expensive”. Silly me. I’ll gladly admit it… So, here goes… I was wrong. Not only are these eLiquids priced right, they certainly deserve the deluxe treatment they got. A 30ML bottle is priced at just $23.00. Considering the cost of the packaging, the R&D that went into choosing the right eliquids, and the marketing budget, that $23 is more than reasonable. When I learned about the pricing I began to relax a little. Clearly NJOY was not gouging the consumer. Then, Dave (Foster, our Operations Manager) acquired a box containing the Artist Collection for our team to review. I skimmed 1.6ML from each bottle and filled an X.Jet Spider and left the team alone to do their job. Below is that review. As for me? I was wrong about the NJOY Artist Collection being pretentious. It is a celebration. An amazing collection of stunning eliquids that delivers incredible flavor, skyscraper high clouds of vapor, and a vape experience that is hard to forget. 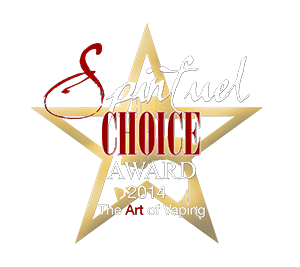 If it were up to me I’d award each and every one a Spinfuel Choice Award. Only it’s not up to me, its up to the team. And with that, I present the Spinfuel eLiquid Review Team. Disclaimer: We have never met any of the flavorists that contributed to the NJOY Artist Collection, but we know their brands. P.O.E.T., Mr. Good Vape, Flavorz, Vaponaute, and Good Life Vapor…these are the companies that make up the eliquids in the Artist Collection. As a team we’ve all enjoyed many eliquids by Mr. Good Vape, and a couple from P.O.E.T.. However, Flavorz and Vaponaute are two brands we’ve never had the pleasure to experience… until now. Along with this review I was able to interview Eric Chesin, the VP of Marketing Strategy for NJOY, and we present that interview in full HERE. We urge you to read the interview to learn more about the conception and execution of the Artist Collection. We received the collection is a white presentation box. Inside the box was a “flavor palette” that describes each of the eliquids in exquisite detail, as well as the individual eliquids in the same deluxe boxes they are offered in to the consumer. At $23 per bottle (glass bottle, 30ML) they are on the high-end of “normal” and in no way are they over priced for the quality of the eliquids. Whether you like them all, or only a couple, we’re betting that you’ll pay the $23 gladly. They are, without a doubt, extremely high quality eliquids. 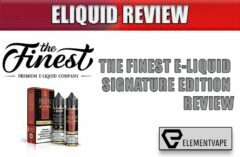 In case this is your first Spinfuel eLiquid Team Review we’ve set up a “Protocols” page so that you can read how these reviews are conducted. As you’ll see, there are no eliquid reviews anywhere that takes the time, and goes through the expense, like we do. Our comprehensive reviews are, honestly, the best you’ll read. Julia – 5 Stars – The incredible complexity of Paramour is simply stunning. From the description I would assume the creamy vanilla and smooth custard would dominate completely, but that is not the case. There are so many individual flavor components yet none of them are vying for your attention. Somehow these incredible flavor notes are maintaining their own identity in the thick mixture of vapor clouds. My mind sees Paramour as coming in on a bed on sweet warm vanilla and custard with a slather of peach and pear preserves resting on top of that bed of warm vanilla… with a warm nutty flavor on the way out… then, at the very last second of the exit a pinch of cinnamon thumps you on the way out, as if to say, “did you get all that?”. More amazing is that the same thing happens over and over again, with every pull. Outstanding! Tom – 4.75 Stars – A very complex mix of some very complex flavors, Paramour is delicious as a vape, but just a touch overwhelming. Don’t get me wrong, I loved it, and will most definitely vape it again, but somewhere along the line Paramour became too complex. I wound up working overtime to keep track of the individual flavor notes, and the expert recipe, combined with the best flavoring components, allowed Paramour to build to a crescendo that ended in with a delicious cinnamon bounce. After half an hour of vaping my mind wanted a rest from working with the massive amount of signals coming from my taste buds. Keira – 5 Stars – A work of art in every way. Layer upon layer of flavors in this here Paramour. Flavors that range from the authentic peach to that of the sweet pear… and from a custard sweetness to the hints of vanilla. Each drag is filled with thick warm vapor drenched in tiny flavor atoms dancing on the tip of my tongue. What put Paramour over the top for me was that ending of cinnamon, perfectly played. Bravo! Jason – 4.5 Stars – There is no question that Paramour is a very serious, very complex eliquid of the highest quality. It has a wonderful pedigree and it’s a pleasure to fill a tank and vape for hours. My only problem with Paramour is that it seems like it is an eliquid developed for its complexity, rather than the complexity being the result of a desired flavor. Complexity for the sake of complexity? Maybe. Still, it’s a wonderful eliquid I plan to have in rotation for the foreseeable future. Julia – 5.0 Stars – Immediately upon my first drag of Hedon’s Bite I felt this was going to be a 5 Star eliquid and a Choice Award winner. Then, that melon flavor (cantaloupe?) hit on the exhale and my senses jerked to attention. My first thought was that the melon ruined the experience for me, but that wasn’t exactly true. I really enjoyed Hedon’s Bite once I accepted the unexpected melon at the end. Still, I think I would enjoy it more without the melon, but that’s a personal perference. That doesn’t stop me from awarding the 5 Stars because the way it was done was ideal. Tom – 5 Stars – I was looking forward to this one more than the others because if there was ever to be a new caramel apple vape for my most recent rotation this could be it. And it is. The description talks about a sweet note, and sour and tart notes, but for some reason the sour and tart notes never really showed up for me…and that was a plus. This is a sweet caramel apple with a twist. Don’t compare this one with other caramel apple eliquids you may already love, this is different, layered, with much more complex flavor delivery than the normal caramel vape ejuice. Keira – 5 Stars – Sometimes you have to give in and allow yourself to enjoy something you don’t think you should enjoy. That’s how I thought about Hedon’s Bite. I loved the idea of a complex caramel and apple eliquid, but I wasn’t so sure I could deal with sweet, tart, and sour all at once. Let me tell you, it is a lot better than it sounds. Perhaps because I’ve vape a lot of Mr. Good Vape, I recognized the flavor profile immediately. Tons of vapor, perfectly executed layers of caramel and different apple notes, Hedon’s Bite is a fantastic vape. Jason – 5 Stars – Ah, the flavor profile of a Mr. Good Vape eliquid! However, as much as I recognize that Mr. Good Vape profile I have to say that had it not been for the NJOY Artist Collection I think Hedon’s Bite would have wound up being a Limited Edition from the brand itself. This is a fantastic caramel apple eliquid, but what makes it different from other Mr. Good Vape eliquids is that there is more layers here, more complexity. And that is certainly the characteristics of the NJOY Artist Collection. Julia – 5 Stars – I loved the description for this wonderful juice. So contradictory. Complex yet simple, robust yet delicate. That is exactly how I would describe it. You really do taste the delicate almond torte, and sweet, complex flavor of wild berries and ever so slight notes from the rhubarb… a European flavor. Then, you’re grabbed and tossed to the ground as you begin to taste the meatier part of this complex vape… the sweet touch of what I can only describe as ‘vanilla bourbon’. You won’t taste an “alcohol” bourbon flavor here, its been distilled to the essence of bourbon, a deep down “scraped from the aged barrel” bourbon. Tom – 5 Stars – Despite the bourbon component, this was the one I thought I would appreciate the least. As soon as I saw ‘rhubarb’ I knew this was going to be a French or English eliquid. I don’t like rhubarb, or so I thought. The magical flavors of an almond torte, wild berries, the aforementioned rhubarb, and the bourbon just combine in a way that produces such a myriad of incredible flavors that you cannot help falling in lust for Sacre Coeur. Keira – 5 Stars – Of the five eliquids in the collection I feel like Sacre Coeur is the hardest to describe. All I really know is that the combined flavor components add up to a vape experience that far exceeds what I believe the individual flavors would be capable of. If I had to pick one thing that put this juice into the 5 Star arena I would have to say it was that almond torte component… what an incredible job of creating a sense of the torte with a side of wild berries. Jason – 5 Stars – I feel like I have to be extra critical of these eliquids because of their inclusion in an exclusive club, you know what I mean? I honestly think that all five, if presented in a line up of eliquids from the brand itself, say a lineup of eliquids by Vaponaute, they would all be 5 Star flavors. Take Sacre Coeur for instance; how can you not be impressed by an almond torte with berries balanced perfectly with a rhubarb flavor and a bourbon finish? This kind of confidence, this level of expertise is rare, yet here it is. Exquisite flavor, thick and aromatic vapor, Sacre Coeur is a fine all-day-vape of extraordinary brilliance. Julia – 5 Stars – Dragon Scape is the one I thought I would have trouble with. Indian spices? Asian Teas? Not me. But…the expert layering, the complex interaction of these rare flavors combine to form a vape that is hard to put down and hard to criticize. Dragon Scape gives me the sense of a Chai Tea mixed with a sweet vanilla, an award winning flavor right there, but then goes on to combine the further intoxicating flavors of a Belgian café giving it weight, substance, balance. Tom – 5.0 Stars – My previous experience with P.O.E.T comes from vaping a bottle of Americano Ciambella, an eliquid that makes my soul cry. So I was ready to be blown away by this remarkable flavor profile that consists of Asian influence and delicate Indian spices. Unlike any eliquid I’ve had, Dragon Scape has so many layers that you can vape this all day long and never get over the deliverance. Don’t be scared off by the use of the word “earthy” in the description. Dragon Scape may have many layers and oodles of complex flavor notes, but together they work the magic. Keira – 5 Stars – The five eliquids in the Artist Collection are all individual works of art with very little resemblance between them. That said, Dragon Scape is by far the most “foreign” to me. A delicious mix of spices and teas, all delivered on a bed of silky sweet vanilla. Not quite my idea of an all-day-vape, but it is in my rotation, and will stay there. Jason – 5.0 Stars – Dragon Scape doesn’t taste much like anything I’ve had from P.O.E.T before. Instead, this very complex layering of spices and teas, delivered on a slice of vanilla bread, would make angels weep with its deep, delicate balance of opposing forces. How these individual teas and spices maintained their personalities is a feat of flavor mastering that is certainly rare. Makes me want to review every P.O.E.T eliquid. Julia – 4.50 Stars – Of the five eliquids in this review the description of Samba Sun is the most accurate. That being the case, two adjectives that are accurate but don’t quite work for me are “airy” and “clementine”. Clementine is another word for orange unless your taste buds are so finely tuned that you can tell the difference in a flavoring. Not hard to do when you have the real thing in front of you, but in a flavoring it’s not so easy. A fine eliquid for hot, sunny days, the clementine is just a hair too tart for me to sink my teeth into. Love the sweet bed of marshmallow, but following up with peach and apricot notes it produces a cacophony of flavors that are difficult to grasp. Not an all-day-vape, but certainly one for warm days. Tom – 5 Stars – An outstanding eliquid to offer up to the Sun God Ra, Samba Sun starts off with a slightly tart clementine, or a less-sweet orange flavor immediately followed by an authentic marshmallow flavor. On the exhale you’ll taste a blend of peaches and apricots that keeps the whole thing light, airy, delicate, and very complex. Perfect as an all-day-vape if you’re looking for an eliquid that won’t bog you down. Keira – 5 Stars – Where Julia found fault I found perfection. Samba Sun is a delightfully complex blend of “daylight” flavors delivered in a way that both satisfies and urges you onward. Samba Sun is a sweet and tart mix of an orange flavor on top of the smooth marshmallow that acts as a sort of casing for all the components, including the ending notes of sweet peaches and earthy apricots. Samba Sun is a strange but wonderful blend of precise layers, proving that some flavorists can do marvelous things with only a few ingredients. Jason – 4.5 Stars – On every level all five eliquids in the Artist Collection are one-of-a-kind works of fine art. You could easily give them all 5 Stars and be done with it, so where do you draw the line? For me, today, it has to be the individual flavor components… Had Samba Sun left out the clementine and kept in the marshmallow, peaches and apricots I would have given it 5 Stars. Then again if the clementine went missing it wouldn’t be Samba Sun, it would play heavier, darker, and not as delicate. For Vapers looking for a light vape for a hot day Samba Sun is a must try. If you enjoy the flavor of clementine’s, marshmallows, peaches and apricots, this is your eliquid, go get it. The words we heard each other say over and over again during our discussion session were “complex”, “nuanced”, and “layered”. These are five are eliquids that we think would not have been created save for the Artist Collection. We imagined the way NJOY approached these candidates (however imaginary it was) would have been something like “Make something great. Push your imagination. Reach for the next level. Use your knowledge of flavor and create something you’ll never forget, that vapers will never forget.” And, as it turned out, they absolutely did. At the same time, The Artist Collection from NJOY doesn’t contain eliquids that could ever replace our “go-to” eliquids, and for one reason; overly complex. Yes, they created genius level work. They created eliquids that will make you want to buy that new tank or glassomizer you have your eye on. They created eliquids that will make you respect the art of eliquid creation just as much as we do. If you’re anything like us, vaping from the NJOY Artist Collection will be ‘substantial’. It won’t be cavalier. Is the NJOY Artist Collection worth buying? Absolutely. We highly recommend it. In fact, if it’s in your vape budget you should consider buying the complete collection so that you can vape a wide spectrum of these special eliquids. You might not like them all, but you will respect them all. Visiting the NJOY Artist Collection website you can find a store that carries the collection. This collection was designed to be sold in the physical vape shops around the country, but some of them also have a web presence so you can buy them online. Lastly, if you think you know NJOY, think again. Head over the Interview with the VP of Marketing Strategy and learn more about the collection, and the company. We were surprised, we think you will be too. Julia, Tom, Keira, and Jason.